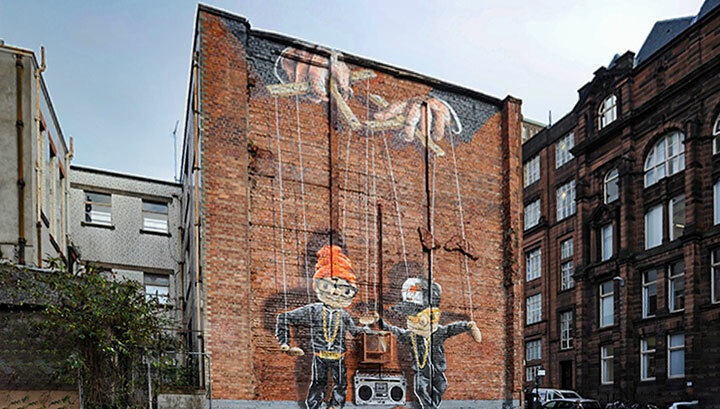 Last week the Hip Hop Marionettes, familiar faces on John Street and a part of the City Centre Mural Trail, disappeared as the redevelopment of the site started as part of the ongoing investment in Glasgow. While they were here, they made a piece of unused city centre land something that people came to see, share and helped send out really positive messages about Glasgow. The Trail is in the top ten “things to do” on the People Make Glasgow site with over 60% of the traffic received here coming directly from Google. The murals are clearly an attraction which people are already aware of or are looking for more information about. More importantly, the Trail is an activity which people want to participate in when they are in the city centre. And this exemplifies one of the great things about our city centre; it works for so many different types of visitors and in so many different ways. The Hip Hop Marionettes mural was painted in February 2016 by Rogue-One working in collaboration with Art Pistol. Rogue has described how the inspiration for it came from the “thought that an interesting concept would be to have body-poppers or break-dancers in puppet form. I took my influence from a Beastie Boys cover and a Run DMC picture.” You can still see other work by Rogue-One in the city centre in such examples as the Billy Connolly murals (undertaken as part of the BBC’s commemorative programme “A Life in Portrait”), the “Hand Shadow Puppets” at Cowcaddens underpass, and the new CR Mackintosh mural above the Clutha pub at the Briggait. Given that murals are viewed as temporary interventions until underused space is redeveloped, the emphasis of the project is always on change. This year alone we have welcomed the following new murals: “St Enoch” (in George Street), “CR Mackintosh” (at the Briggait), “Crazy Cat Lady!” (in Sauchiehall Street), and the second “Woman in Black” (in St Andrews Street). The day that St Enoch launched it was the most viewed image on any public sector website the UK! Finally, another critical feature of the City Centre Mural Trail is that it is artist-led and open to everyone through the City Centre Mural Fund. Anyone wishing to submit an application should be aware of the basic requirements; find a space (in the city centre), get the owner’s permission, come up with an artwork concept, and present us with a workable plan. If it meets with the judging panel’s approval, we can progress accordingly. 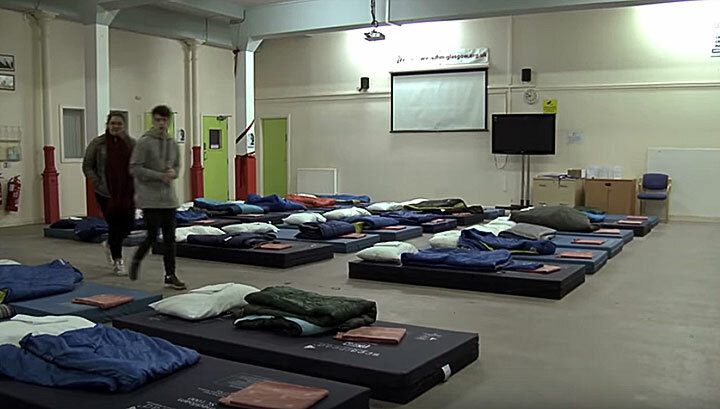 The Glasgow Winter Night Shelter is a facility that runs every night from 1 December 2018 to 31 March 2019 for those who are in need of a place to sleep. The shelter is located at 35 East Campbell Street, just off the Gallowgate and is close to the city centre. The Shelter has a capacity of 40 beds, but more often than not it doesn’t reach capacity. The past three years have been hectic for the Shelter. Last year, it had 600 guests, staying for 3,800 bed nights. Given the rise in homeless in the past few years, it’s crucial to get this information out into the public domain, so that no one goes for a night without a warm bed to sleep in. The Shelter is open to anyone in need from the age of 16+ and the doors open at 10pm each night. A street outreach service to help and support people sleeping rough (or risk of) to access accommodation and any other services appropriate to their needs. Providing Christian Care since 1826. Advice and support for homeless and vulnerable people, including food, clothes, showers, activities, IT and advocacy, also an International Café. Daytime: Open Monday – Friday 10am – 10pm for activities and one-to-one help. The primary aim of this project is to provide immediate accommodation for those who are in need. Additionally, the objective of the Shelter is to give hope to all who come through their doors. The Shelter works closely with other homeless agencies throughout the city. This is key as they have the expertise required to help those in need and to make them aware of the services available to them. The team at the Glasgow Winter Night Shelter, for example, connect people to the Glasgow City Council Homelessness case team, in the hope that accommodation can be found. The Shelter employs dedicated seasonal staff and volunteers, without whom it could not do the fantastic job that it does. The team consists of ten members, working shifts, supported by 40 volunteers. Please have a look at the video below to see what happens at the Glasgow Winter Night Shelter. On behalf of all from the Glasgow City Centre team, please keep up this excellent work!